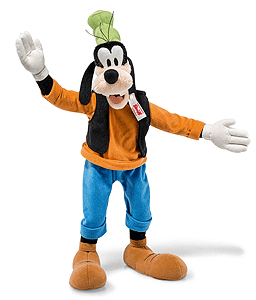 Goofy by Steiff. This beautiful hand made piece, in multicoloured mohair, wears the white ear tag, signifying this item as a Steiff limited edition, together with the famous gold plated Button in Ear. Limited edition of only 2000 pieces worldwide. Product details: jointed, safety eyes, synthetic filling material, non growler, size 36cm. Comes boxed, together with a numbered certificate of authenticity. Good-natured but scatterbrained, Disney's cartoon character Goofy is well loved the world over! Goofy first appeared, somewhat disguised, as a member of the audience in Mickey’s Revue (1932). Goofy was distinguished from those around him not so much by his languid appearance but his raucous laugh. That laugh created such an impression on Walt Disney that the character was soon featured in other cartoons. Before long, Goofy was part of the gang that included Mickey, Minnie, Pluto, Clarabelle Cow, and Horace Horsecollar. There were 49 Goofy cartoons, but he also appeared in many cartoons with Mickey Mouse and Donald Duck, as well as more recent television series and videos. He is best known for his series of “How to" cartoons, where the audience laughed at his bumbled explanations and antics. Well, who wouldn’t laugh, "Gawrsh" everyone knows and loves Goofy!